The Tropico series is well established, with players mostly enjoying their forays into running a ‘banana republic’ paradise as El Presidente. Pick the way you want to rule – a despotic capitalist, a benevolent commy or just someone in between, but the fun comes from picking sides. You begin as the ruler of a few tiny islands called Tropico. The lands are fertile and lush, perfect for your many new crocodile ranches. 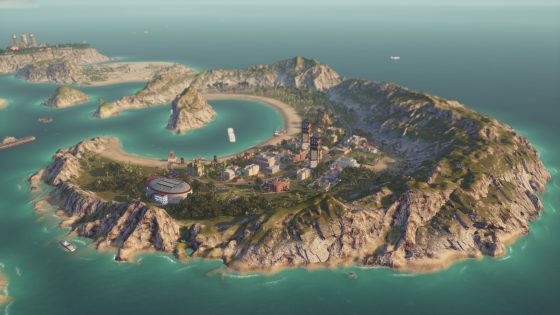 Tropicans arrive at the island looking to their new leader for security and prospects of a better life. El Presidente must provide jobs, food, and entertainment for his citizens, and setting up these things is almost effortless – if you have the capital to spend. Having said that, the developers may have taken new players for granted a little. The building menu and other functions work well and are generally easy to navigate, but only if you know what you’re looking for. Older players might find it obvious how certain elements of the game work, but for a new player, it almost becomes a trial by fire when you consider some of your tasks require completion within a certain amount of time. In fact, the finer elements of the game are tucked away in submenus and aren’t immediately obvious without some serious poking around. One example of this was placing the bus garage, and not knowing where to find the bus stops so we could make a route for the Tropicans to take a ride. It wasn’t immediately clear that these types of item placements come from within the building itself, opposed to within a building submenu. But before long, there was our very own mini-Metropolis, complete with high-status buildings such as opera houses, radio stations and theatres for my (free) bus-ride loving citizens. The first couple of story-based levels ease you in nicely, but it seems after that, everything seemed to fall apart. The bank balance was dropping quicker than an over-burdened banana tree, and my allies were bailing me out every other month. Having just achieved separation from The Crown, we almost felt embarrassed for El Presidente. Trying to find out exactly why money was haemorrhaging was another story. The on-screen notifications tell you when a freighter comes in, how much money it was worth in trade and how many new migrants it bought in. But the outgoing costs continually sink the books. Once the economic sub-menu was discovered, we didn’t really feel any more enlightened – running an empire is just expensive, everyone needs paying. Eventually, it stabilised after building power stations and material processing factories, but we spent the remainder of the time playing cautiously, as though the next expenditure could see El Presidente being deposed for being an overzealous spendthrift. The Crown, citizens, revolutionaries, the other factions – all their needs stack up. The Crown wants more resources from you, and in return they’ll let you ‘play’ at being El Presidente a bit longer, the Revolutionaries want you to help build an uprising, and other allies you make along the way all want a little slice of your own special brand of corruption-tainted sunshine benevolence – should you last long enough as ruler to do so, as helping one side often comes with a consequence of losing trust with another faction.